Wood art ... nature inspired. In line with the growing trend towards large-format tiles for both walls and floors, RAK Ceramics has launched some of the largest ceramic tiles in the industry within the region. The new sizes of 41.6 by 120 cm, 40 by 80 cm and 30 by 100 cm allow consumers to create impressive designs using fewer grout lines and, therefore, reducing the design interruptions on both walls and floors, according to spokesperson for the UAE-based ceramic and sanitary ware manufacturer. These large-format tiles also make spaces look bigger, he adds. “RAK Ceramics is continuously introducing new patterns, textures and sizes that provide a wide variety of choice for clients. Always looking to be a pioneer, RAK Ceramics recently launched Maximus Mega Slab, an extra-large-format porcelain surface measuring a gigantic 1.35 by 3 m – becoming the only company in the region to have installed this technology,” he states. The Maximus range includes slabs of 135 by 300 cm, 120 by 240 cm, 29 by 120 cm and 120 by 120 cm. Produced using Sacmi Continua+ technology, Maximus Mega Slab is twice as thick as traditional porcelain with an exceptionally high breaking strength. Suitable for use on walls, floors, façades or to replace kitchen surfaces and bathroom vanity counters, their extra-large size means they can be installed with fewer grout lines, giving a more aesthetically pleasing finish, the spokesman explains. “Maximus Mega Slab has caused quite a stir in the market so far and is expected to grab a market share from its granite counterpart with its superior qualities and long-term durability,” he adds. Maximus Mega Slab is being showcased throughout 2015 at a number of high-profile trade shows and exhibitions around the world. Following its launch at Cevisama – a leading exhibition for architectural ceramics, bathroom and kitchen furnishings, raw materials, glazes, frits and machinery – held in Valencia, Spain, the slabs have also been shown at Revestir, an expo on sanitary ware, coverings, faucets and finishing in Sao Paulo, Brazil, Coverings tile and stone exhibition in Orlando, US, and will also be showcased at Cersaie, an event for the ceramic tiles and bathrooms industry to be held in Bologna, Italy (September 35 to October 2). Commenting on the market trends, he says: “There is a clear trend in the market towards designs inspired by nature. From warm woods to daring marbles and time-tested stones, our latest collections are all best-sellers and are proving to meet customer demands every time. 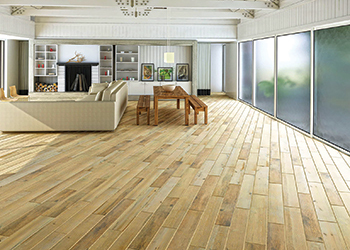 “The beauty of these collections is that they are all eco-friendly, versatile and easier to maintain than natural material counterparts such as real wood or real stone. 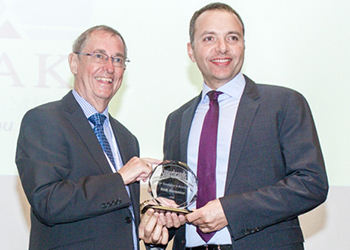 Massaad (right) ... receives the Superbrands award. RAK Ceramics was last month awarded ‘Superbrand’ status from a large and diverse selection of other well-known brands in the UAE vying for the accolade. Superbrands is an independent organisation that hosts the annual event to recognise the UAE’s best brands and is considered the world’s largest independent brand arbiter. The awards are designed to honour the UAE’s strongest and most exceptional brands and submissions are reviewed by high-profile judges, whose focus is mainly on the inherent strength of the organisation and its brand values. Since its inception, RAK Ceramics has invested heavily in building a strong brand. With a highly innovative approach to business practices and the accelerated deployment of state-of-the-art technology across its manufacturing plants, RAK Ceramics brand has flourished and the company is now one of the largest ceramics’ manufacturers in the world. In 2014 RAK Ceramics achieved Superbrand status for the sixth consecutive year; was Gold Award Winners in the Large Enterprise Category at the SAP Quality Awards; won Best in Managing Employee Health at Work at the Asian HR Leadership Awards; received a Customer Engagement Award (Excellence in Digital Marketing Innovation) for its Smart Design Application at the Asian Customer Engagement Awards; and won Best Tableware at the Pro Chef Middle East Awards. Habeichi, Maan and Rabahie ... new members. RAK Ceramics has seen stable growth in its performance this year so far. Its adjusted net profit in Q1 2015 rose by 22 per cent compared to Q1 2014 to reach Dh75.8 million ($20.6 million), driven by a continued focus on implementing the ‘Value Creation Initiatives’ set by the company in 2014 and the launch of 25 new formats of tiles at international exhibitions and trade shows. “Geographically, (sales in) Saudi Arabia recorded an 18 per cent increase in revenues in Q1 2015 compared to Q4 2014 – the result of a proactive strategy to strengthen and consolidate the distribution network and ramp-up B2B (business-to-business) capabilities,” he says. Segment-wise – revenue for sanitary ware increased by 0.7 per cent to Dh110.9 million ($30.19 million) in line with the company’s focus on expanding its sanitary ware business across the UAE, India and Bangladesh. Sales for this segment in the UAE increased by nine per cent to Dh83.4 million ($22.7 million) compared to Q1 2014 figures. 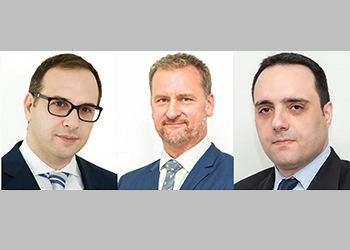 RAK Ceramics has also further expanded its management team with three new senior appointments, underlining its commitment to accelerate its growth momentum globally and reinforce the company with the best talent. This move follows the appointment last February of Stefan Schmied as president of tiles and sanitary ware and Raaqib Mutvalli as head of the performance management office. The new expanded management team, which will support the Value Creation Initiatives, include George Rabahie as chief legal counsel and company secretary, who will be working closely with the leadership team to manage all the legal and regulatory aspects of the business globally; René Maan as regional vice president based in Europe, who will be working to accelerate strategic growth initiatives for the European business in cooperation with the current structure of joint venture partners; and Philippe Habeichi as head of investor relations, responsible for creating and communicating the company’s strategy and equity story with the investment community. Maximus Mega Slab ... superior quality. 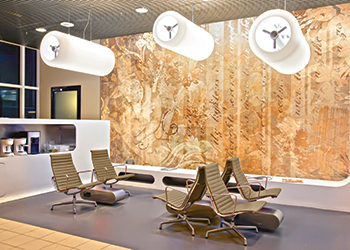 RAK Ceramics has recently supplied a range of tiles to Dubai International Airport, including products from its Wood Art series for installation in the First Class lounge. “The architect originally wanted to use real wood for the lounge, however fire safety is crucial in an airport environment and therefore Wood Art was selected as a safer alternative,” the spokesperson comments. Available in a wide range of designs and colours, these highly durable gres porcelain tiles are fire-, termite- and water-resistant and very easy to maintain. The company has also supplied 150,000 sq m of unglazed and glazed gres porcelain floor tiles and glazed ceramic wall tiles for the project. Other prestigious projects RAK Ceramics has supplied around the world include Atlantis, The Palm, Burj Al Arab and Ferrari World Theme Park in the UAE; Heathrow Airport, O2 Arena and Wembley Stadium in London, UK; and Princess Noura Bint Abdul Rahman University, Al Jawharah Tower and Najran University, in Saudi Arabia. Projects in the pipeline include: 21 world-class hotels, 23 residential towers and 18 villa projects including Sheikh Mohammad Bin Rashid Housing (1,209 villas), the Arabian Ranches extension (945 villas) and Dubai Silicon Oasis Complex Phase II (1,047 villas).